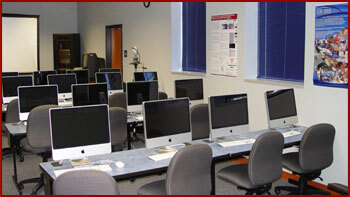 The CERSER Laboratory consists of computer workstations on Macintosh, Linux, and Windows platforms; remote storage areas of polar data; servers including a local web server and file server. Also available is an undergraduate research lab containing workstations configured to allow the use of three separate operating systems depending on faculty or student needs. CERSER operates a Sea Pro Model 210 research vessel with UHF Radio, Raytheon 300 GPS and Raytheon 365 Depth Finder. The vessel utilizes an Imagenex SportScan dual channel, high-resolution, digital sidescan sonar with a 23 meter tow cable. For land research, CERSER utilizes a SIR-3000 Ground Penetrating Radar by Geophysical Survey Systems, Inc. The SIR-3000 is a small, lightweight system designed for single user operation and incorporates advanced signal processing and display capability for in-the-field 3D imaging. The Umfort GRID Cluster provides ECSU a top-ranked five teraflop MSI high performance computing system, building on its distance education and undergraduate laboratory infrastructure to create tremendous outreach capabilities. The 64-node, 512-core “Umfort” computing cluster is an IBM iDataplex cluster with blades that each house dual quad-core Intel Xeon 2.33GHz processors and 16Gb of RAM. Umfort also includes the Matlab Distributed Server, R, OpenMPI, Java and various other open-source compilers as available services to users. Internet and external users connect to the server through a 1Gb fiber connection that is then split to the various components of the cluster through a 10Gb switch. 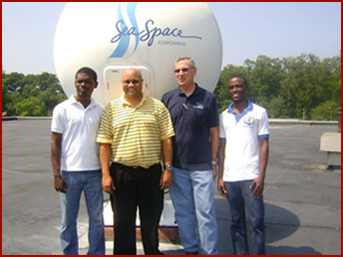 The Terascan ground station within CERSER was installed in 2002 on the roof of the Dixon-Patterson Hall. The system currently has a 1.5 meter parabolic dish housed in a dome connected to a TeraScan TAC-92 receiver. Used to both store and process incoming data a 32-bit CentOS Linux-based system is connected to the TAC-92 and RADAR dish. The system specifications include an Intel(R) Pentium 4 1.6GHz processor, 512MB of random access memory (RAM) and dual 200GB hard drives. A 10/100 connection to the campus network provides access to operating system updates, remote maintenance, and remote transfer to the CERSER web server. The Polargrid Lab in Lane Hall serves as a virtual classroom configuration that consists of a Polycom 8000S system (H.232 and SIP) with 2 channels of 14-kHz audio, stand-alone audio conferencing phone interfaces and Global Management System collaborative communications. The PolarGrid Lab has 17 state-of-the-arts computer workstations and presentation machines. Workstationunits are setup as dual boot systems with Macintosh OS 10.6, Microsoft Windows 7. The Ubuntu Linux platform is available via virtual machine on the Macintosh platform. The classroom is completed with a high-definition projector and surround sound speaker system to allow participation of faculty and students in various training events outside of the ECSU campus.